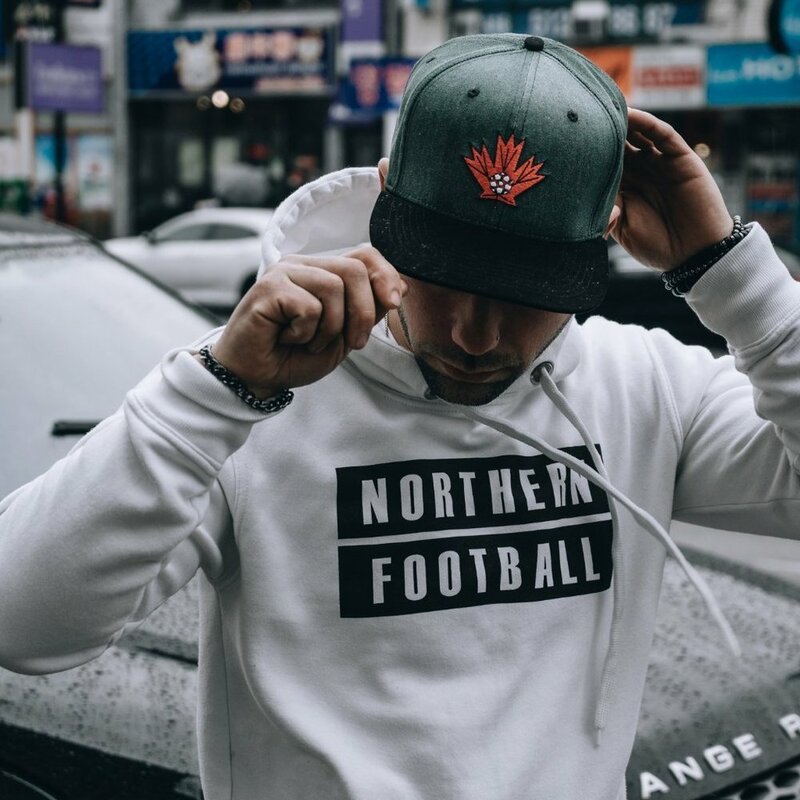 Northern Football Apparel is a streetwear brand and apparel company that promotes football culture in Canada. In this interview, we’ll learn how the brand got started, and how they’re bringing fashion + football to fans across the country. R: Northern Football was inspired by the buzz being created around Canadian soccer. It stemmed from the idea that something was missing in Canada compared to other countries that are considered footballing giants. The popularity of soccer in South America, Europe, and many other places around the world is much greater than it is here in Canada, but it’s not completely due to the product we have put on the field in the past. Many countries in those continents see soccer as a religion. You can find kids playing barefoot in the streets, and also ballers in every corner. We like to throw around the word “culture” a lot, but there’s no other way to describe it—It’s a passion, a way of life, and for some it even gives them a sense of purpose. It’s more than just a game, and I feel that in Canada, this mentality is starting to come to fruition, with the Canadian Premier League, and our national team looking stronger than ever. The fans are beginning to rally around that, and it’s really exciting to see. Northern Football aims to be united by Canadians across the country, coast to coast, as a symbol of national pride amongst football/soccer fans. Q: For years, footy has sparked fashion trends in Europe, South America and Africa. Since your brand represents an intersection between streetwear and football, how have you seen this influence grow in Canada and North America? R: We’ve seen some pretty awesome stuff in the U.S., but the closest thing you’re going to get to an intersection between streetwear and football would be Nike or Adidas. Of course though, these companies are U.S. and German based, so before Northern Football, there was nothing that was uniquely Canadian. The market is pretty fresh right now, so it’s something we’re exploring day by day through our operation as a brand. Q: What have the reactions from customers and footy fans been like so far? R: The feedback has been incredible! We’ve been receiving fantastic support from players, coaches, and fans all over the country, and have even had individuals outside of the country join Northern Football Apparel. Football Culture is here Canada! We’ve created an outlet for fans to show their culture and passion through a clothing brand made specifically for Canadians, and now it’s up to the people to spread the word and build our brand’s story. So far, the fans are doing a great job, and we’re excited to see where 2019 and beyond takes us! Q: We’ve recently just seen Canadian Premier League Club, Pacific FC open a flagship store in downtown Victoria, BC. It looks dope! Do you have any plans for a physical retail space or even pop-up stores in the future? Q: Beyond apparel, how else do you see your brand impacting footy culture in Canada? R: Not only are we creating fashion for Canadian soccer fans, players, and coaches, but we are creating a big idea. Football can be expressed off the pitch, in something as subtle as a T-Shirt, a hat, or a hoodie. The difference with Northern Football, is that it’s our own—It’s uniquely Canadian, and we’re here to let everybody know. For years we’ve been beaten, disrespected, and disregarded, on and off the pitch, just for being Canadian. 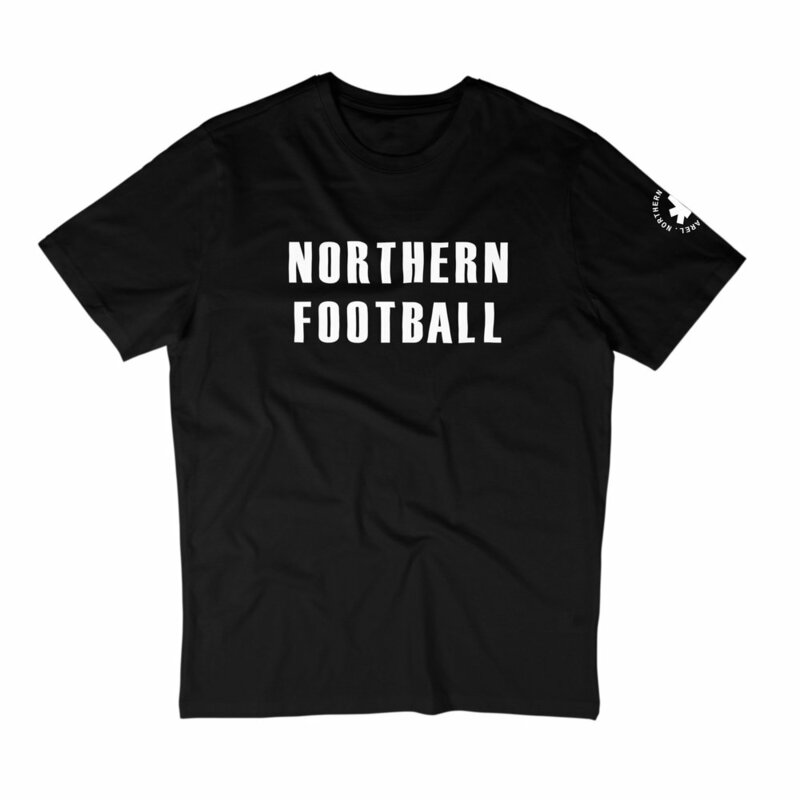 Northern Football is a celebration of our uprising in the world soccer landscape, and will be there every step of the way.